So says the sign hanging over the kitchen in Naked City Taphouse in Seattle’s Greenwood neighborhood. Here, the beer showcases the best of the Northwest, the wine is selected with care, and the food is exceptional beyond the normal pub grub. 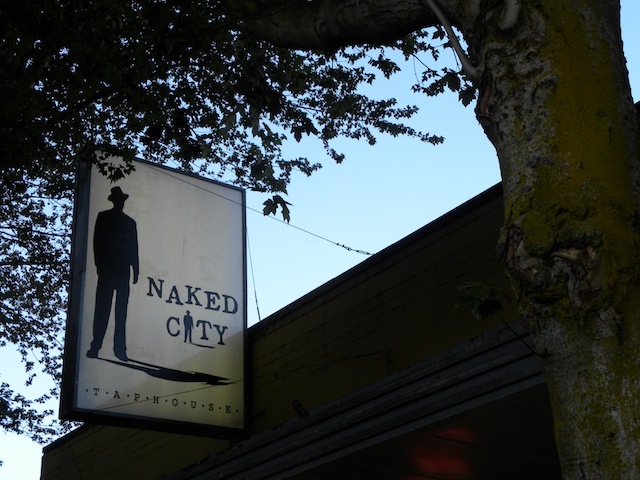 The two of us spend our days in Greenwood, where we hold our day jobs, so Naked City is a natural fit for our post-work writing brainstorms. The sign above may as well be the motto for the inspiration we’ve found here. 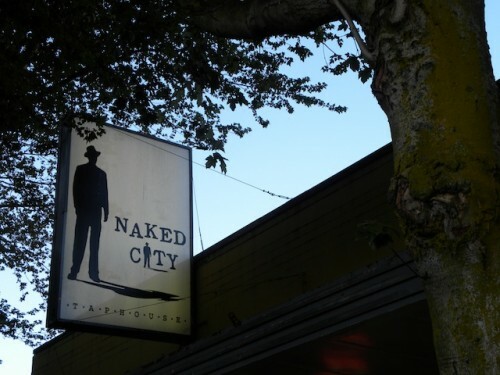 When the two of us publish our novels, we’re likely to include Naked City in the acknowledgments, for the time we’ve spent here letting our creativity brew. Best known for their beer and pretzels, Naked City also provides a full menu featuring locally produced artisan bread, house-made pickles, menu items for both carnivores and vegetarians, and selections for voracious appetites (a selection of hearty sandwiches) and nibblers (landjäger, sliders). The beer is the focal point, with a comprehensive selection including a couple dozen options available on draught. They even brew their own beers. Come for the beer, but also try their great wines. While you’re not going to find Cayuse or Isenhower here, their small but well-chosen list will exceed your expectations for a pub, and their house wine–a pinot noir–around the $5 mark is definitely above average. 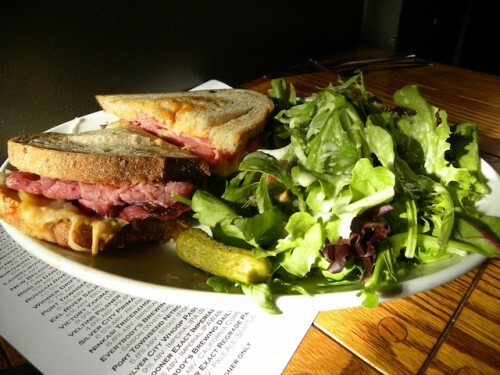 Reuben – This is possibly the healthiest reuben out there; at least it tastes like it. Full of flavor and packed thickly with meat, but not oozing with grease, Naked City has perfected the balance between decadence and restraint in this classic sandwich. 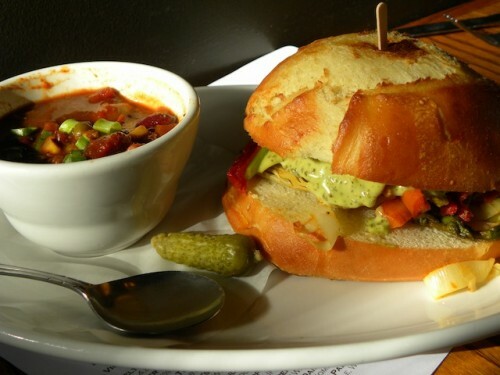 Veggie sandwich – Not your average vegetable sandwich, stuffed with artichoke, asparagus, carrots and onions, this one comes on a pillowy bun from Essential Bakery (confirm fact) with a sauce so flavorful it’s hard to miss the meat. It’s sure to please both vegetarians and carnivores. Smoked cheese and tomato sandwich – Okay, maybe it’s not fair to mention an item that’s no longer on the menu, but I’m still holding out hope that a future menu revision will bring this delightful sandwich back. Open-faced on a wonderful bread, the Beechers smoked cheese was melted with slices of tomatoes was perfect simplicity, especially when paired with a salad with the house vinaigrette. Naked City boasts a traditional pub style with a few unique touches. With the typical mirrored bar backdrop reflecting the back bar with stacked glasses, the local art hung on the adjacent wall contributes a neighborhood flavor. What makes this venue even more notable are the two TVs hanging on both ends of the bar showing old black and white movies and ESPN. It provides a great mix. You can catch the tail end of Casablanca while waiting for the Sounders kick off. In terms of volume and writability, the background air is mostly composed of subtle white noise of chatter and low, but not obnoxious music, in various genres from beat based to oldies. Nothing overwhelming. The decibels are high, but like all good white noise, easy to talk over. Some writers may consider it welcomed noise because enough is going on that one can sit and work in anonymity. There is ample table seating for two-to four and two-sided bar seating. They will also accommodate larger parties for critique groups. It’s a family friendly establishment with high-chairs readily accessible. Purchased presence calls for at least a drink, maybe with some scrumptious food if time allows. With an underlying energy, this is the perfect venue for a person who works well with white noise. But if you are driven to distraction, this is not the place for you unless you can utilize it. It’s a good location for a writer who needs to get out of the house, get a jumpstart, or for someone who works best under the scrutiny of watchful eyes (whether the eyes care if you are working or not). We’ve found that, often times, looking busy leads you to be busy. And if it’s enough of a distraction to hamper your work, perhaps you just need a break or you need to call a writing buddy to join you for some valid accountability. This is a great writing venue with a lot going on, one way or another, you can use the bustle to your advantage. Set your own time frame and writing goals to get done – this is an excellent deadline destination. It’s also good if you need a short brainstorm session. 90 minutes – beer or wine or two, plus food like a sandwich and your piece can be done in the length of a soccer game. Street parking is readily available if you’re willing to walk. While one can often find a spot on Greenwood Avenue virtually right in front, it can’t be guaranteed in this up-and-coming neighborhood. If you can’t find parking on Greenwood Ave, head north on Greenwood, turn right on 87th and travel a block east until you reach Phinney Avenue North. You’re likely to find a spot on the street between the Safeway parking lot and the apartments across the street. Come equipped with a composition book and a pen with plenty of ink; the written word–rather than the typed–will flow as smoothly as the beer being poured from the taps. Laptops, while welcomed, erect the invisible don’t-disrupt-me-walls and clash with the convivial atmosphere here.